This is a practical and actionable guide built on 20+ years of experience building high-performing marketing organizations across firms, specialties, industries, geographies, and budget levels in global and regional firms. It will help you build the best Marketing organization for your firm. Your marketing organization shouldn’t be your competitor’s marketing organization. 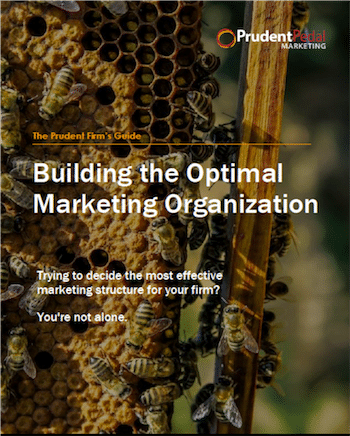 While firms share attributes, the optimal marketing organization is unique to each firm. Even if firms share discipline, size, and geographic footprint, they differ in culture, priorities, expectations, organizational structure, and budget. “Do we need a (fill in the blank) person? Determine the structure, roles, skills, and gaps you need to fill to achieve your strategic objectives and invest marketing dollars wisely. Answer the “5 Tough Questions” you really should be asking to get the right Marketing structure and level of investment to maximize ROI. Determine if your Marketing organization is actually the problem you need to solve. Get aligned with Marketing’s real purpose, given your firm’s culture and manage partner expectations. Select the proper metrics to produce the desired business results more quickly.